In India, the three primary options available to students who have passed their Class 12 examinations are – Science, Commerce and Arts stream. While the first two are the most sought after, attracting the ‘best’ students with the highest percentage of marks, the Arts stream is often said to be the bastion of the ‘weaker’ students – or those who have passed their Class 10 with a lower percentage of marks. Sad but true, isn’t it? But nothing could be further away from the truth. Contrary to popular perception, students who opt for the Arts stream post their Class 12, have a growing list of career options that they could pursue as per their aptitude and interest. Popular career choices in this category include; Law, Journalism, Humanities, Animation, Education, Performing Arts, Fashion or Textile Designing, Travel & Tourism, IT & Software, Hospitality and Banking to name but a few. 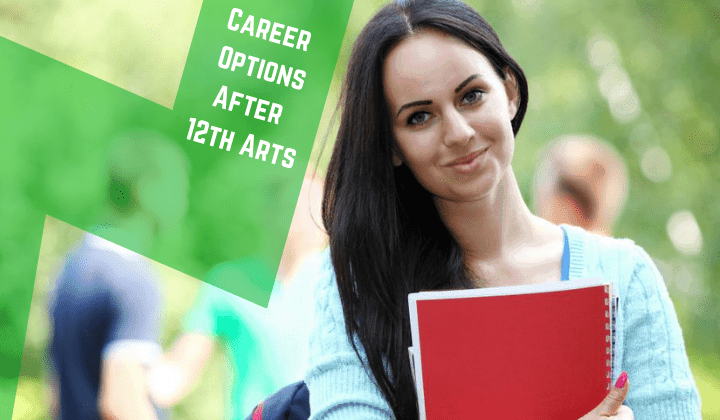 So for the benefit of all those Class 12 Arts students who are most likely to run around frantically from pillar to post searching for viable career options post their exams, here’s a curated list of the 12 best career options after 12th arts that you can consider and choose from. 1. Bachelor of Arts (B.A) in Humanities & Social Sciences. One of the most popular career options after 12th arts, a B.A degree is a three-year undergraduate degree course which focuses on subjects related to the liberal arts and social sciences. Preferred subject options for specialization include; English Literature, Economics, Political Science, History, Sociology and Philosophy. Post the completion of their BA degree; students have the option of studying further and doing their Masters in Arts (M.A). Career options: Banking, Marketing & Sales, General Administration and Retail. Again an undergraduate course for art students interested in pursuing a career in fine arts like design, dance, painting, art or filmmaking. Curiously enough, it also attracts students with an active, creative streak from the Commerce and Science streams. Students who opt for this course have the career options of specialising in a range of creative pursuits which include; the applied arts, drawing and painting, filmmaking, and ceramics among others. Career options: Exhibition Designer, Artist, Illustrator, Secondary school teacher, Museum/Gallery Curator. Looking to make a career in graphic/web design and animation? Then this undergraduate degree course after 12th arts is just right for you. Students opting for this course have a slew of choices when it comes to choosing their field of specialisation. Some of the more popular career choices include; 2D/3D Animation, Animation Film Making, Graphic/Web Design, Sound & Video Editing and Visual Effects (VFX). Students from Science and commerce streams are also eligible to join this program. The BA LLB program is a popular career option after 12th arts opted by many students. It is a five-year dual degree professional course in administrative law which targets students wanting to pursue a career in the legal domain. Interested students need to first clear their Class 12 (in any stream) with a minimum 50% marks and then pass a Common Entrance Test to join this course. This course covers Arts-related subjects like History, Economics and Sociology in addition to legal topics like Tax Laws, Criminal and Corporate Laws etc. Students get to choose between – Constitutional law and Criminal Law – as their area of specialisation post joining this course. Career Options: Independent lawyer, Corporate lawyer, Human Resource Specialist, Labour & Employment lawyer, Legal consultant, a Public prosecutor. This course for arts students is best suited for those who are looking to make a career in the booming hospitality and/or travel and tourism industry. To be eligible to join this course students need to have cleared their 10 +2 examinations in any stream or possess any other equivalent qualification from a recognised board. This arts course offers students multiple choices to specialise in critical aspects related to the functioning of both the industries. These include hospitality/hotel management, culinary arts, catering and fares & ticketing. Career Options: Travel & Tour operators, Airlines, Airports, Online Travel websites, Visa & travel document service firms, Hotels & Resorts, Tourist information offices and Luxury Cruise companies. The Bachelor of Hotel Management in Hospitality & Travel course is another proven career option after 12th arts in order to make a career in the hospitality or travel sector. Career Options: Same as above. A Bachelor of Science or BSc in Design degree can be your stepping stone to becoming a sought-after designer. 10+2 students from all three streams (Science, Commerce & Arts) are eligible to seek admission to this undergraduate course, which has a duration of approx. 3-4 years, depending on the institute. List of specialisations here includes; Communication design, interior design and fashion design among others. Career Options: Architecture, CADD, Interior design, Graphic design, Fashion design. This three-year long undergraduate degree course is aimed for arts students with excellent communication and writing skills who wish to join the growing media (print, online & electronic) and the advertising industry. Open to 10+2 students from any stream; this three-year course offers students the opportunity to specialise in areas like journalism, films & television, media planning and music & sound production among others. Students should definitely opt for these courses after 12th arts which are having a good scope in future. Career Options: Corporate Communications, Journalism, Content development, Digital Marketing, Advertising copywriter, and Associate broadcast producer. Are you an articulate and creatively inclined individual looking to make a mark in the highly competitive mass communication and media industry? If yes, then this three-year undergraduate course can give you just the right foundation to build a long and successful career option after 12th arts in either of these exciting domains. The duration of this course is generally 3 years with 6 semesters. The curriculum encompasses a vast area related to advertising, communications and public relations. Options to specialise include; journalism, advertising, public relations and corporate communications. In this computer-driven world, a BCA degree can give you the power to explore computer languages. A demanding computer course after 12th arts stream, a BCA degree is generally recognised to be on par with a B.Tech/B.E degree in IT or Computer science. Any student who has cleared his 10+2 with Mathematics, scoring a minimum 45% marks can apply for admission to this three-year course. Networking Hardware & Security, Mobile App Development, Programming, Cloud Computing and Game Design are some of the choices available for specialization. Career Options: Systems Administrator, Desktop Technician, Helpdesk Assistant. Freelance web designer, Computer teacher/instructor. This after graduation course for arts students is for those who are inclined towards teaching as a profession. This two-year undergraduate degree is aimed at 10+2 students looking to join the teaching profession at the playschool/nursery/kindergarten level in reputed academic institutions. You also have the career option of doing your B.Ed (Bachelor of Education) course upon completion. Career Options: Education Counsellor, Content Writer, Junior Teacher, Librarian, Home Tutor, Record Keeper. The Bachelor of Business Administration and Bachelor of Legislative Law Honours, commonly known as BBA LLB is a five-year undergraduate integrated course for 12th arts specialising in the field of administrative law. What sets it apart from the B.A LLB course is the fact that this career option for arts students will get you a chance to study a combination of subjects related to business administration and law. The minimum qualifying criteria here is a 10+2 with a minimum 50% marks. Combining the best of business practices with legal knowledge, this course is best suited for students looking to begin an entrepreneurial journey or joining a business enterprise. Career Options: Banks, Consultancies, Excise & Revenue Departments, Judiciary, Business Houses, Sales Tax. So there you have it. Some of the best career options after 12th arts that can translate into a fruitful career depending upon completion. All you need to do is select a course (which excites you the most), choose a recognized institute to do it from and you’re good to go. Always remember – It’s not what you achieve, but what you overcome – that’s what will define your career. All the very best.